Fencing Product Type Construction/Temporary Fencing. allFENZ Safety Fence provides superior quality barrier. Heavy duty material for ultimate weatherproof protection and durability. Bright and vibrant color provides warming effects. AllFENZ Safety Fence provides superior quality barrier. Heavy duty material for ultimate weatherproof protection and durability. Bright and vibrant color provides warming effects. Heavy duty plastic. Abba Patio, a top designer and manufacturer of high quality gardening products, from patio Umbrellas, Canopies, Awnings to Garden Furniture sets. Each piece is sleekly designed, rigorously tested for durability, and assembly instructions have been standardized for simplicity from start to finish. Use as a visual barrier or safety Fence. Made in the USA with 100% selected materials. Size:4' x 100'. We do not accept P.O. Boxes. 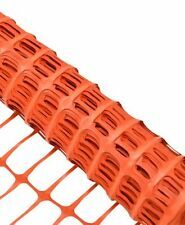 This Orange Safety Fence is an economical fence with multiple uses. This safety fence is perfect for sporting events, concerts, fair and carnivals when a visual barrier is needed. RESIDENTIAL AREA. CONSTRUCTION SITE. 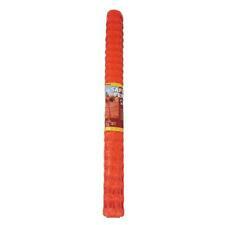 (1) Sandbaggy 4' x 100' roll of Orange Safety Fence/Snow Fence. Possible uses: enclosing construction sites, snow fence, enclosure. Use as a visual barrier or safety fence. Made in the USA with 100% Selected Materials. AllFENZ 1-3/4 in. x 4 ft. x 100 ft. Orange Safety Barrier Fence. Qty 6 Rolls. allFENZ Safety Fence provides superior quality barrier. Heavy duty material for ultimate weatherproof protection and durability. Snow/Safety Fence, Orange Plastic, 4 x 100-Ft.
48” x 100’ plastic orange snow/safety fence. This 4’ x 100’ plastic orange snow/safety fence weighs 16.8 lbs. Installs easier than wood fencing. HD polyethylene plastic. Used as a safety barrier, safety fence, snow fence, snow guard,Protect your property's safe. Use as a visual barrier or safety fence. Orange High visiblity Color, Beware from far distance. Heavy-Duty Snow Fence, Orange, 4-Ft. x 50-Ft. This heavy-duty Orange Plastic Snow fence is reusable and easy to install. UV-treated to resist fading and extend outdoor life and uniquely constructed for extra strength. Heavy-Duty Snow Fence, Orange, 4-Ft. Weighing in at 16 lbs per roll and with a tensile strength of 89 lbs/ft, this 4' x 100' green TENAX snow fence can also be used to block snow drift in parking lots, at airports, and industrial buildings. Heavy-Duty Safety Fence, Orange, 4-Ft. x 50-Ft. Heavy-Duty Safety Fence, Orange, 4-Ft. uv-treated to resist fading and extend outdoor life and uniquely constructed for extra strength. Uniquely constructed for extra strength. Heavy Weight Orange Safety Barrier Fence 4' x 100'. SAVE 30% off by purchasing 100 Rolls of Safety Fence (10,000 LF). Heavyweight Orange safety fence. High-visibility orange. Size: 4 ft H x 100 ft L/ roll, Weight: 8 lbs/roll. Heavy-Duty Safety Fence, Orange, 4-Ft. x 100-Ft.
Lightweight orange safety fence. Used for small jobs when larger rolls aren't needed. Fence openings is 3-1/4" x 3". Check Out Our Other. 4' x 50', 1.75" x 2.12" Mesh, Orange, PVC Safety/Barrier Fence, Most Economical Safety Fence Used As A Visual Barrier For Crowd Control & Around The Job Site. About theSAFETYFENCE 48" ORANGE SAFETY FENCE. SAFTY FENCE 4X100IN ORG ECONO. Use as a visual barrier or safety fence. Made in the USA with 100% Selected Materials. Fence is 4 feet tall and 100 feet long. It is U.V stabilized for greater durability. 4' X 100' Dry Top Orange Fence. a superior quality fence used to delineate the work zones and define boundaries. The lightweight plastic fence is easy to transport and easy to install. It tears down easily. Can be an excellent alternative to traditional steel wire fencing. Lightweight material for an easy-to-transport and an easy-to-disassemble fence. Looking for a large, highly visible orange warning barrier?. The Tenax Beacon Plus was designed for just that! Barrier safety fence orange. Use as a visual barrier or safety fence. Color: Orange. Size: 4' x 100'. Lot sale of (2) new 4 ft x 100 ft rolls of Orange Safety / Barrier Fence by Midwest Air Technologies Inc. Made in USA. This is a 3 X 330 foot safety net barrier fence. Also good for concerts, sporting events, carnivals, fairs, and wherever a visual barrier is needed. Highly noticeable and easy to install and relocate. 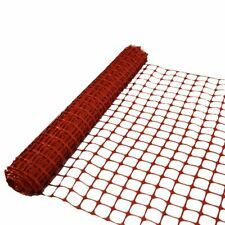 4' x 50' 1.75" x 2.12" Mesh Orange PVC Safety/Barrier Fence Most Economical Safety Fence Used As A Visual Barrier For Crowd Control & Around The Job Site.4-Ft. x 50-Ft. 1.75-Inch x 2.12-Inch Mesh Most Economical Safety Fence Used As A Visual Barrier For Crowd Control & Around The Job Site. 4' x 50' Heavy Duty Orange Safety Fence Reusable Easy To Install 2 Times Stronger Bright Color & Unique Heavy Duty Design Make It Great For A Multitude Of Uses Construction Sites Crowd Control Athletic Fields Hazardous Areas Event Parking Farm Use UV Treated To Resist Fading Extend Outdoor Life.This heavy-duty orange barrier fence reusable easy to install and two times stronger. Its bright color and unique heavy-duty design make it great for a multitude of uses including: construction sites crowd control athletic fields hazardous areas event parking and farm use. uv-treated to resist fading and extend outdoor life and uniquely constructed for extra strength. Reusable. 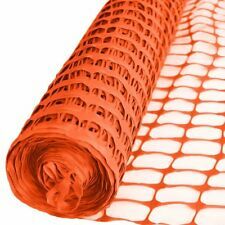 Tenax 82119104 4X100Orng Snoguard Fence, 4' x 100' Orange. Publisher: Tenax Corporation. Label: Tenax Corporation. Use as a visual barrier or safety fence. Color: Orange. Made in the USA with 100% selected materials. 4'x 100', Orange Poly, Safety Grid Warning Barrier Fence. A highly visible, heavy duty fence that provides long lasting strength and hazard protection.